Today ends the Classic Horror Block, and begins Zombie Week! Several friends recommended this one, including my cousin Drew. What up, Drew? Holwerdas represent! WRITER 1: "Right, so we need a villain. What's the most evil thing you can think of?" WRITER 1: "I was thinking zombies, but you've just given me an idea." Although this movie covers all the usual bases, there's enough fun in the details and execution that I really enjoyed it. One of the members of the group is a movie buff, and wears t-shirts with posters of other zombie movies. When two of the characters are arming themselves, there's a very quick, very great little homage to Evil Dead when one of them grabs a chainsaw. Best of all? After five days of horror classics with creaky paces and Hays Code restrictions, I finally got to watch a movie that not only had a body count, but also a kill before the opening title card. When 28 Days Later came out a few years ago, it introduced a new element to zombie movies, the fast and aggressive zombie. I'm still kind of torn about this. To my mind, a zombie should still be a shambling mindless body whose real strength comes from overwhelming numbers and unstoppability. 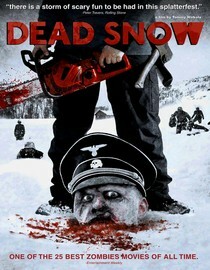 Dead Snow is very much in the fast zombie camp - in fact, not just fast, but also strong and intelligent. These zombies still use weapons! Even though I'm still a fan of the slow zombie, I still thought this setup really worked. The commanding officer in particular cuts a very menacing and impressive figure. The scene where SPOILER he chases down one of the students and clocks him with a hammer was great. A very fun movie, definitely worth catching if you're a fan of zombie flicks. 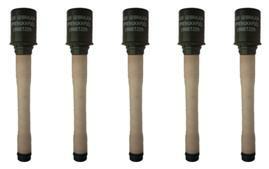 I give it five German stick grenades out of five. Well that seals it. Now I'm gonna have to watch it! Yes!! Glad this recommendation made it to your list and glad you enjoyed it! I loved how the final showdown occurs in daylight.. proving that scary movies don't need to all occur at night under a full moon. Good luck on the rest of your movie marathon!